BEYOND NEW! 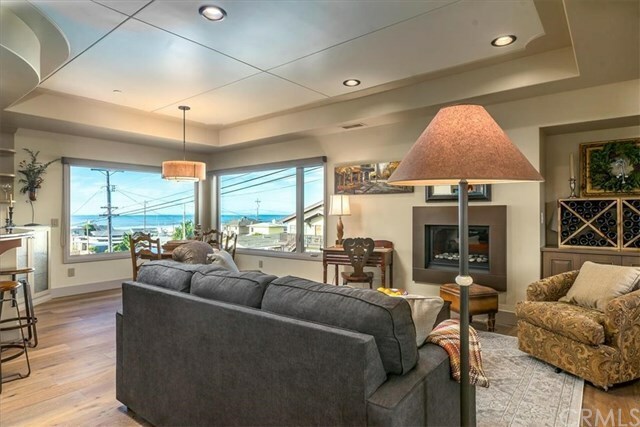 This carefully crafted remodel occupies a rare Numbered Streets corner parcel that offers street level entry AND sweeping ocean views! The entry is highlighted by stonework, leaded glass door and the patina of Corton steel. The street-level plan includes living, dining and kitchen areas, expansive windows capturing white water views, plus master suite and powder room. Lower level has 2 guest bedrooms, guest bath, utility area and an oversized single garage. The quality materials, fixtures, and appliances create a cozy contemporary theme with easy care in mind. Nest technology adds convenience and efficiency. Highlights include an eat-in kitchen featuring special granite counters, stone backsplash, Jenn-Air appliances and color coordinated soft close cabinets. Grohe fixtures are featured throughout the house and creative lighting sets a mellow mood. The ample master suite includes amazing tile work in the shower and thereâs a large double vanity. Metal banister and a unique schooling fish baluster lead the way to a lower level with 2 bedrooms, full guest bath, Washer Dryer area oversized single garage and access to patios and yard. The prime location is near the 19th street Coastal Access thatâs a perfect vantage point for the breathtaking white water displays at Whale Rock. Call your RealtorÂ® today and prepare to be impressed! Directions: Located on Cass Avenue on top of 18th St.